The Associated Press compared the significance of Thursday's Senate Judiciary Committee testimony by Brett Kavanaugh and Christine Blasey Ford to such landmark historical tragedies as the September 11 attacks and the assassination of John F. Kennedy. Ford, who has accused Kavanaugh of sexually assaulting her at a high school party in the early 1980s, and Kavanaugh will testify about the charge. The day will be critical to whether Kavanaugh is confirmed to the Supreme Court, which appeared all but certain before Ford went public with her charge nearly two weeks ago. "Like the Kennedy assassination, Challenger explosion and the twin towers, will the Kavanaugh-Ford hearing be a where-were-you moment? Read all of @AP coverage here," the AP tweeted, with a link to its up-to-the-minute coverage. NBC News host Willie Geist simply tweeted about the comparison, "Good Lord." 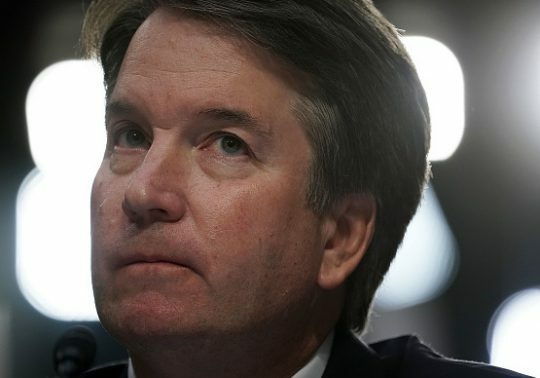 This entry was posted in Politics and tagged Associated Press, Brett Kavanaugh, Media, September 11, Supreme Court. Bookmark the permalink.